"Your children will become who you are. Let me just start by saying, I am NOT an expert on co-parenting and to be honest, I don't think I ever will be. There are days upon days when I feel like for every five steps we take forward, we turn around and take ten steps back. Because let's face it, trying to parent with someone who doesn't really like you and who is no longer in the business of caring what you think is hard. But, regardless of my non-expertise, the Lord has been working on me to share my triumphs and struggles, and how I am trying to make co-parenting work for my daughter. So, please forgive me in advance if I step on anyone's toes. I know that everyone's situation is different and that not all parents are in a position to co-parent after divorce. I am also well aware that some single moms face a host of challenges when trying to co-parent with the father of their children and visa versa. I know that my thoughts and experiences may not help everyone, but if they can at least help you find a light at the end of your co-parenting tunnel, it will be worth it. Let me just start by saying that I am blessed. Like ridiculously blessed. Despite the heartache that I have endured over the past three years, I wake up every morning with the reminder that the Lord has not turned His back on me. He has loved me through my darkest hours and pulled me from a pit of despair only to bless me over and over. This is the number one reason that I know that I am on the right track with my life. One of His biggest blessings is that my daughter has been blessed with two parents who love her very, very much and who are committed to being the best parents they can be. I am not one of these single mom's that has to fight tooth and nail for my daughter's dad to pay attention to her or help provide for her. My daughter's dad is a great father. Even on the days I don't particularly like him, he is still a great father. Period. I had to learn to accept this fact months ago, because I knew that for us to be able to successfully co-parent together, I would need to make the fact that he is such a great father my mantra and I have. In addition to recognizing that he is a great dad, despite his faults, I have also taken up the habit of praying for my daughter's dad. Let me tell you, it is incredibly hard to "hate" someone you have been convicted to pray for and it has become the number one way I have found to keep my attitude and my words in check. Before I meet with him to drop my daughter off, I pray. Before I talk with him about anything of any kind of significance (tuition payments, holiday arrangements, parenting issues, etc. ), I pray. Before I lose my temper with him over something really dumb or something really important, I set my phone down, I walk away, and I pray. I pray A LOT these days. It is the only way I have found to keep my focus and to keep me from turning into a crazy ex-wife on steroids. Do I succeed at this every single day? No. But, ever since I started praying through our situation, I have found that my "bat-sh*t crazy" moments have decreased from once a week to once every couple of months and I feel like I just keep making progress. Over the last year, I have learned through prayer that we communicate and work through things so much better when I choose not to be a crazy person. I know this to be true, because let's face it: we're divorced. I don't have to listen to him yell at me anymore, and he no longer has to put up with my fits. We have turned over our rights to treat each other that way, and we have to work on viewing our relationship like a business partnership instead of on the deeply intimate level it once was. My ex-husband and I are now "in the business" of raising our daughter together. And just like any business transaction, great communication is key. I know that this may seem a little heartless and deeply impersonal to view co-parenting my child this way, but I believe it is the only way I have been able to separate my personal problems and hurts that are associated with my ex-husband and our divorce from the fact that we still have to raise our daughter together. At the end of the day, he isn't going anywhere and neither am I, so what good does it do to anyone, especially my daughter, for us to be at each other's throats all the time? So instead of stamping my feet and pretending like I'm the only one who is right, I have had to learn to give a little. Instead of screaming and threatening "to take him back to court", I have had to learn to let some things go. I have to take a deep breath and walk away from my phone A LOT. I have to pick my battles and make sure they are worth it, and I have had to learn that I am the only one responsible for my emotions and my actions. I am the only one who has that power, and it's up to me whether I let someone else have that power or not. In real life, I am not a crazy person. So, it was high time for me to quit acting like I was. And after much resistance, I bit my tongue, got a grip, and forced myself to remember that I had a job to do. A job that is five years old, 3 1/2 feet tall, and still a very long way from adulthood. Once I accepted this and added more prayer to my daily life, I was able to do a better job of tackling the challenges that come with co-parenting including the challenge of future step-parents. Not only has my daughter been blessed with a great dad, but she has been blessed through the significant others of her dad and I. A major fear for me when my ex and I first separated was all of the unknown women that I thought he would be bringing in and out of our daughter's life. And in the beginning, I really struggled with it. The thought of him eventually finding another woman and making her his wife literally used to make me physically ill. Not because I wanted him back, but because the thought of my daughter calling another woman, "Mom", was more than I could bear.I would lash out at every woman he brought around our daughter, including the woman he has currently been with for over a year now. It took me a long time to accept the truth that his current girlfriend had nothing to do with our divorce, and so therefore I needed to quit taking my hurt and resentment out on her just like I had watched my mother do to every single woman my father has ever dated since their divorce eight years ago. Even though I had always said I never wanted to be like that, the truth is, I was being like that, and it needed to stop. So, I let down my guard and opened my heart to this woman that I know I will be sharing my daughter with for a very long time. She is a good woman. She is kind to my daughter, and my daughter loves her. She is everything I have prayed that God would bring into my daughter's life in the form of a step mother, and I am grateful for her. Truly. I don't even say that with a forced smile and gritted teeth. I say that because it's the truth. Yes, we still tread lightly around each other as we try to find our middle ground. I phrase my questions to her over and over again in my head just to make sure they sound kind and respectful before I send them to her. My daughter talks about her constantly, and I let her. I only praise her to my daughter, because I want my daughter to know that it's okay to love her. There is no resentment here. And while she and I still have a lot to learn about each other and how exactly our relationship is going to work, I have seen huge strides in the direction I have always hoped co-parenting with my ex-husband would go just by opening up the line communication with her. Do I still struggle from time to time? Yes. And I probably always will. I am human. 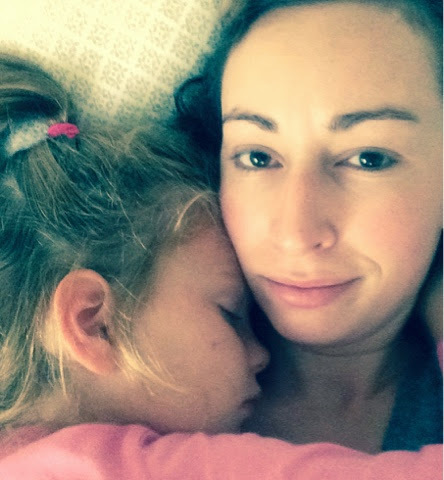 I am fiercely protective of my daughter, and I worry about losing my identity as the mom. It is truly a fine balance-one that we are far from perfecting-but, as long as we keep the ultimate goal of parenting our daughter and what's best for her in mind, I think we are all going to be just fine. Like I said, I am NOT an expert. And I realize that my situation is probably more ideal than a lot of co-parenting situations single moms find themselves in. But, I also feel like sometimes we, as single moms, make co-parenting harder than it needs to be. Because let's face it, divorce hurts. It hurts so FREAKING bad. And we want nothing more than to punish the person who hurt us and unfortunately, when we start seeking revenge the only people who get hurt in the crossfire are our children. I may not always like what my ex-husband does or how he parents our daughter, but I am not responsible for him or his parenting. I am only responsible for myself and how I choose to parent our daughter from my end. As long as he is actively trying to be a part of her life and we can find some common ground on major parenting issues, I consider that to be progress and successful co-parenting. Our daughter deserves the best version of both of her parents, and the best version of ourselves does not involve screaming and blood shed over minor details. Our job is to strive to work together, even when we fail. And on those days, all we can do is pick ourselves up and try again tomorrow. Thank you for posting such true and honest parts of your journey to co-parenting. The key is prayer, which I didn't even think to pray for him, as some days I am mad, hurt, and shocked I am at this place of uncertainty. But I shall pray each step of the way, thank you for reminding me. All the best as you continue your journey. I am new to this journey of co-parenting and while unfortunately my ex husband is not a good father. He won't pay attention to the children and any woman he would bring around the kids I would be concerned about ( safety reasons). I hope I could eventually find peace with the situation but I don't know if I could stomach my babies have a new mommy. I think I will try your parenting as a "business" relationship and give up my " crazy person" that I know I have become.